Crystal Palace and Upper Norwood has an amazing rich and diverse heritage. On this interactive map (click here), you can explore Nationally listed assets (by Historic England) and Locally Listed (by each of the 5 boroughs) marked with Blue and Yellow Icons. Shown too are the many commemorative plaques (eg famous people or historic boundary markers) shown as small coloured dots. 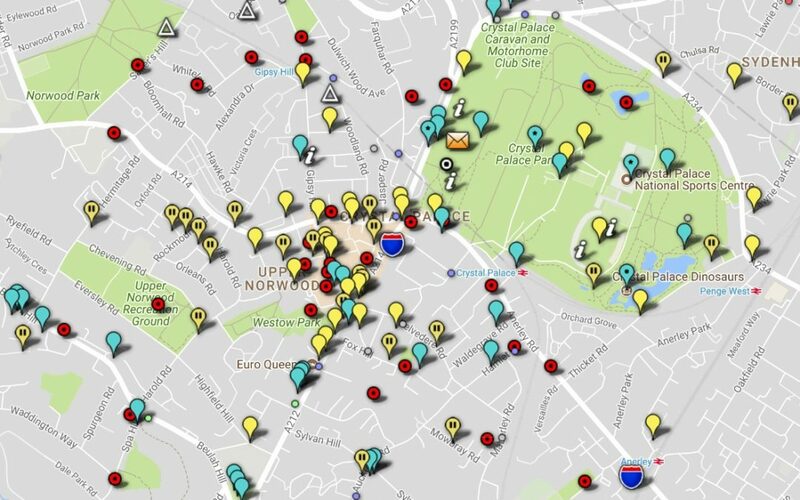 Small dots are: Blue Plaques, Green Plaques, Red Plaques and Black Plaques (shown in grey, and include boundary markers). Web links to their source listing/info pages.Entries have web links to their listings and photos. Large Red Dots are potential for listing. Please help, and make your suggestions for what’s missing! Have you spotted a boundary marker or plaque, or other listed feature not on the map? Please contact info@cpneighbours.org to add others listed/plaques heritage features onto the map (attaching a photo and location details). The area has many local heritage and ‘Friends of’ groups, and local reference libraries to help discover the area. More detailed information to be provided soon. e.g Norwood Society (click here). All the heritage mapping data is being created in standard format to allow sharing with other other groups/uses. There are many conservation areas in CP area too, an overview is here.